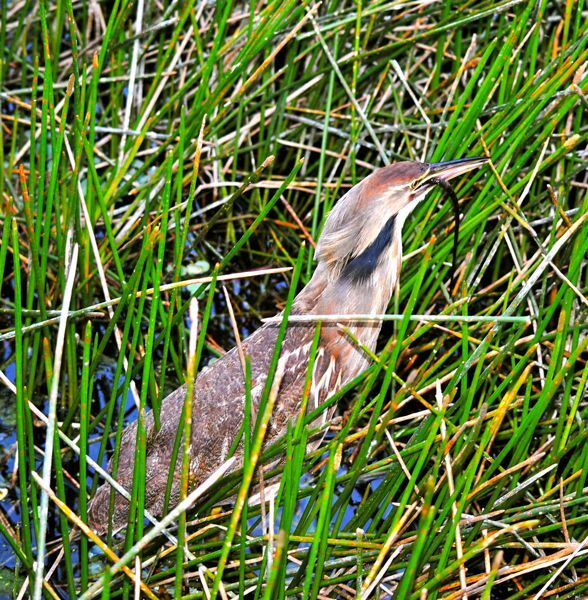 American bittern, photographed at Green Cay Nature Center, Boynton Beach, Palm Beach County, in February 2013. If you ever glimpse a large brownish bird as it disappears into the tall reeds of a wetland on an early evening during the cooler months, it could be this guy, Botaurus lentiginos. 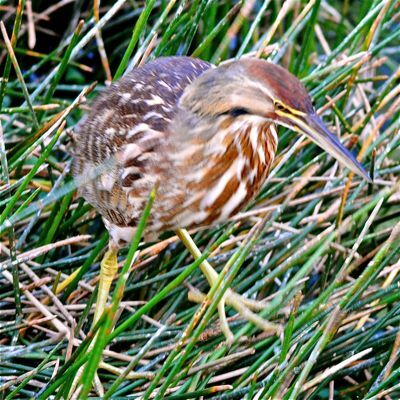 The American bittern. In most cases, that glimpse is all you're going to get. American bitterns are perfectly plumed to blend into the scenery and they tend to be most active when lighting is least. Occasionally they will venture out into the relative open earlier in the evening, but those occasions are the exception rather than the rule. 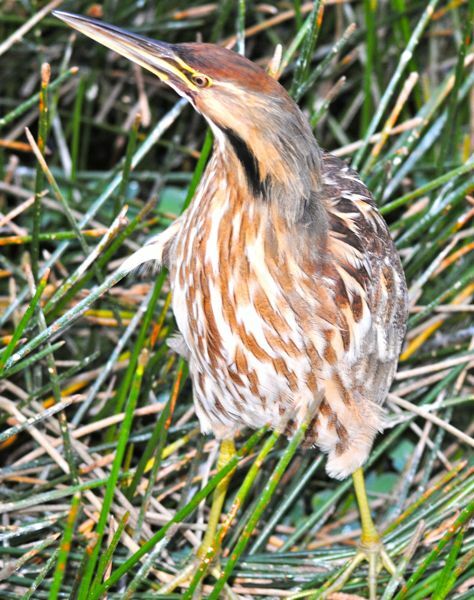 Americans are somewhat similarly colored as their least bittern cousins, and share the same habit of upwardly cocking their heads. But they are much, much bigger and hang out in different parts of a wetland. Americans are winter visitors to South Florida, while leasts are here year round. They are a mix of light browns streaked with some white, with a black stripe about the neck. They can be two or three feet long, with a wingspan of three feet. Leasts will top out at 14 inches long, and a wing span of 18 inches. So size alone makes it easy to separate the two bitterns. Probably the bird that's closest in appearance to the American is a juvenile night heron but bitterns have longer necks and their distinguishing habit of upwardly cocking their heads. For the most part, American bitterns are migratory birds. They spend summer breeding in Canada and the northern third of the United States. In winter, they'll retreat to the Atlantic and Gulf coasts from roughly the Carolinas to Texas to find places where water won't freeze over. Americans are also found in the Bahamas, Cuba and Mexico. There are pockets in the Chesapeake Bay region and coastal California where American bitterns are found year round. 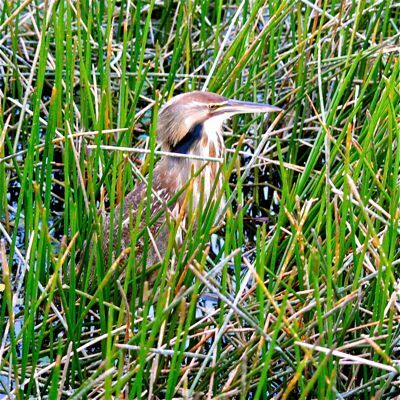 American bitterns breed in freshwater marshes. 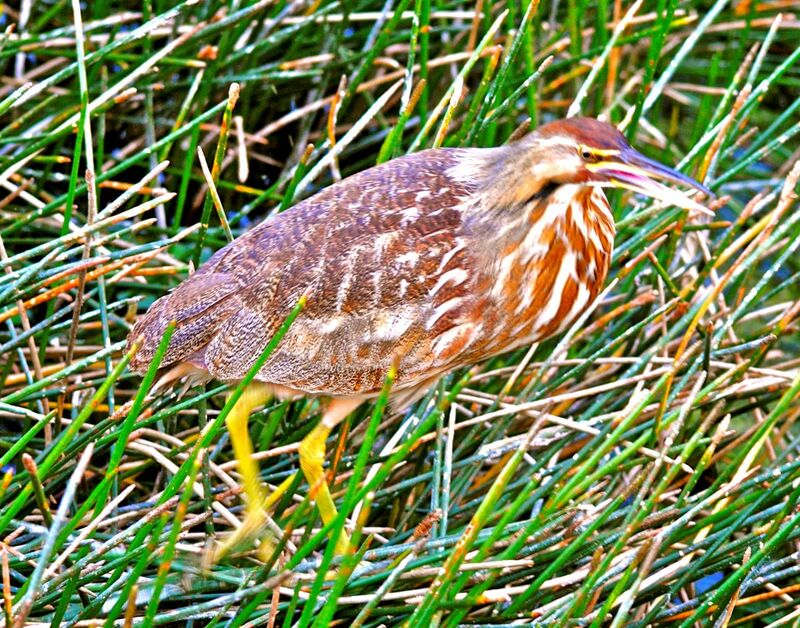 They build nests made of marsh plants like cattails just above the water in dense vegetation. Occasionally they will nest on the ground if suitable cover is available. Females will lay one to five eggs, which will take three to four weeks to hatch, and provide all their care once hatched. The young will be nest bound for one or two weeks but remain under the care of mom until they're about a month old. According to Audubon, their age of first flight is unknown, but it's probably seven or eight weeks. American bitterns eat everything from bugs to fish to reptiles and small mammals. If you look carefully at the photo above left, you'll see the tail end of a snake in the bird's mouth. They forage by standing perfectly still at the water's edge and thrusting their bill to grab a passing morsel. They will also slowly stalk through the shallows. As noted above, the two bitterns tend to be found in different parts of a wetland, leasts in denser vegetation over deeper water, Americans in less dense areas with shallow water. 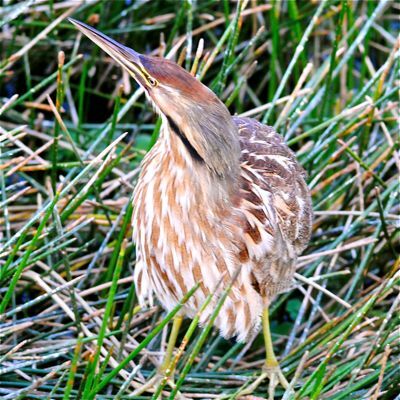 So exactly where does the word, bittern, come from? Apparently from the Middle English bitour, which derives from the Old French butor, which may derive from the Latin word for buzzard, butio. In Europe, buzzard refers to a broader group of birds than it does in the U.S. and includes hawks. In any case, American bitterns are members of Ardeidae, the family of herons, egrets and bitterns.